Published on April 30, 2010 in Elections, International and UNC. 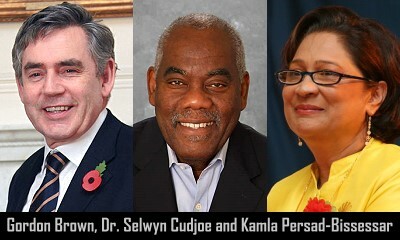 6 Comments Tags: Gordon Brown, Kamla Persad-Bissessar, Politics, Selwyn R. Cudjoe. It couldn’t have come at worse time. You are down in the polls. You have a reputation of having raging tantrums, being dour and bereft of the common touch. Although you are a good Chancellor of the Exchequer you are seen as the ultimate bureaucrat. Your political advisors say that you have to get out more; meet the common man and woman; exude more warmth; smile a lot with them which will make the electorate feel closer to you.